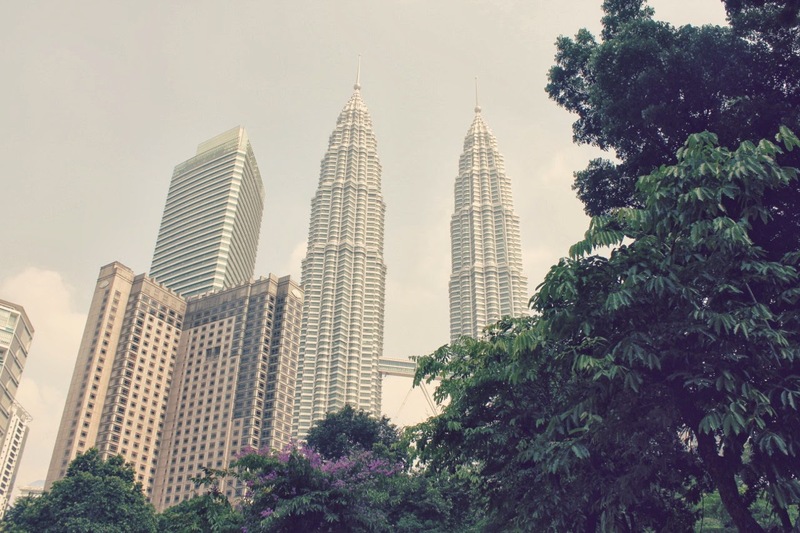 buynow/bloglater: Hello from Kuala Lumpur! Sidenote: I have already bought Fresh body lotion and Boscia cleansing oil but I have spotted that they sell Tarte here....anything good there? The 12 hour foundation perhaps? 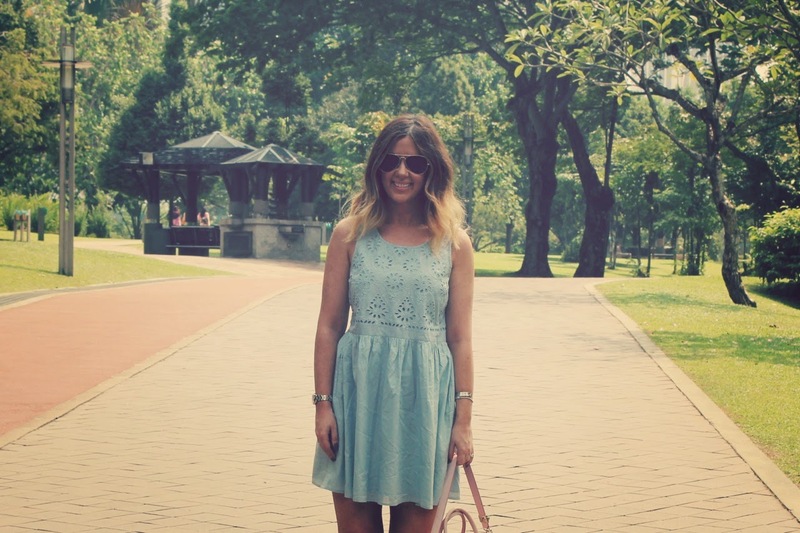 For my aimless walking I wore a new dress from Topshop - called the Chuck On. I got this because it's that easy, breezy smock shape and 100% cotton. This place is seriously humid (as my frizz tells you) so this was a good choice. I also love the embroidery detail on the boobage area and the colour....its pastel blue so of course I would love it! I wore this during a walk around KLCC park. After living in Dubai for so many years it's seriously lovely to just hit the pavement and explore - especially as KL taxi drivers are impossible to deal with when you're such an obvious tourist! Now my tan...it's totally and completely fake. And I love it. 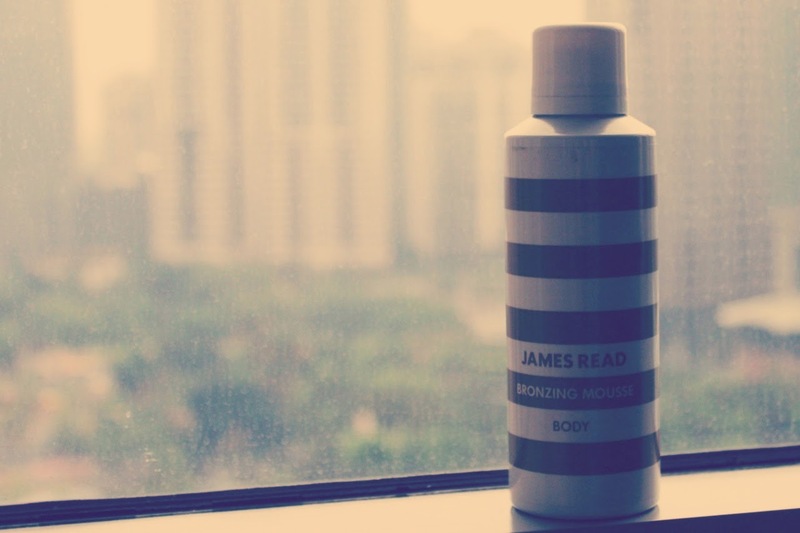 I used my (possibly) all time favourite tanning mousse by James Read. I bought this when I was back in the UK and although it's not the cheapest brand out there, it's one of the best I have tried. I just love the tone of it but most of all the way it wears. Fake tans that fade nicely are hard to fine but this seems to just gently disappear, even from dry and difficult areas. I should add that it also is totally undetectable in terms of scent - I am married to a man that absolutely despises the smell of fake tan and can smell it from a mile off. He has no idea I am wearing it - although once he looks at me he can pretty much tell! I love this so much that I also bought the James Read Liquid Tan recently so I'll let you know if that is even better. Okay, I am going to get ready for dinner now. I have no idea where to head to though so if you are from KL or have recently visited, put your recommendations below! I have Exposed but I will definitely check out the other two! Thanks so much Bianca! A favourite of a blogger/YouTuber I like called HeyClaire, uses/likes a blush called Blissful, it looks lovely! ah I love that dress!! I spied it on the topshop website a few days ago and wasn't sure, but totally sold on it now! Think I might pick it as the weather (hopefully) gets warmer in the UK!! hope you enjoy your trip, you look lovely! I second the Tarte blush in Natural Beauty! Terrifies me in the pan but looks gorgeous on. My family is from KL and I'm so jealous that you're over there! Don't worry about not doing cultural things, the culture in KL is all about the shopping malls ;) Make sure you visit the beauty shops in the malls to get a taste of what Oriental makeup is like too - it's all about the eyelash formulas and whiteners! Cultural things to do: If you get time, visit the bird park and butterfly farm, both are lovely and colourful! Also make a trip to one of the pasar malam (night markets) and eat lots of street food - the best thing about Malaysia is the food! My favourite is roti canai from the mamak shops :) Have fun - can't wait to see what else you get up to! omggg I am in love with your bag! :) amazing photos as usual! Go to Singapore for the day. We found there wasn't much to do in KL for more than 2 days. Enjoy your trip! My hometown! Though I haven't lived there in nearly 15 years. The food is the main draw card as another commenter said. Though I suggest heading out to Batu Caves if you get the chance, Petaling Street, and up the Twin Towers of course. But seriously, the food girlfriend (and the people watching that ensues), you are in for a treat. Just hit any stall/non-chain restaurant that is crowded with locals and you will be fine. KL sounds (and looks!) like such an amazing place! I have a financé who can also detect fake tan and HAAAATES the smell of it, so I will definitely be trying this one!! That is such a cute dress Laura. I'm loving pastels right now. Enjoy Kuala Lumpar! Tarte blushes are the obvious choice but the Lights Camera Lashes is one of the most amazing mascaras I've seen in a while. The Marajuca Oil is amazing. After only a day I saw a noticeable difference in my skin. finally your tan post! do you also use that for your face? You always have the best spring time color outfits! Hope you have a fun time! Have so much fun!! Definitely try some of the tarte lip products because they are fantastic! love the dress, that colour suits you really well! Tarte foundation is really good, I just did a review on my blog!!! Try the Lotus restaurant in Bangsar for some good Indian food served on banana leaf. Just across from it is Bangsar Village, a shopping mall that I think you might enjoy browsing through as well. FYI, if you're staying in the KL city centre, Bangsar is about 15-20 minutes away. I've been a silent reader of your blog for awhile. I don't follow many beauty bloggers (not even the local ones, since I'm a tech blogger in KL myself) but somehow you seem relatable to me. I live in KL and to see a Dubai blogger like yourself in a picture of KLCC a backdrop which is literally a stone's throw from my apartment seems surreal. Guess you're here for the F1 weekend, albeit short I hope you enjoy yourself. If you ever want a local to show you around, or hang out, drop me a line. It would be awesome to meet you in person, after following your blog for so long.